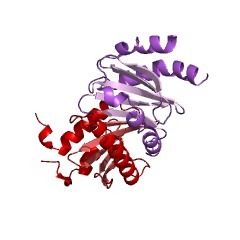 Mitogen-activated protein kinase kinase 1 interacting protein is a small subcellular adaptor protein required for MAPK signaling and ERK1/2 activation. 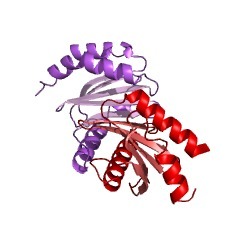 The overall topology of this domain has a central five-stranded beta-sheet sandwiched between a two alpha-helix and a one alpha-helix layer PMID:15263099. Ragulator complex protein LAMTOR3 (for lysosomal adaptor and MAPK and MTOR activator 3) is a regulator of the TOR pathway, which is a signalling cascade that promotes cell growth in response to growth factors, energy levels, and amino acids [(PUBMED:19539012)]. There are 566 MAPKK1_Int domains in 564 proteins in SMART's nrdb database. Taxonomic distribution of proteins containing MAPKK1_Int domain. This tree includes only several representative species. 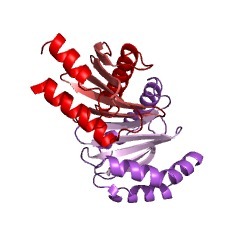 The complete taxonomic breakdown of all proteins with MAPKK1_Int domain is also avaliable. Click on the protein counts, or double click on taxonomic names to display all proteins containing MAPKK1_Int domain in the selected taxonomic class. Signaling pathways in eukaryotic cells are often controlled by the formation ofspecific signaling complexes, which are coordinated by scaffold and adaptorproteins. Elucidating their molecular architecture is essential to understand thespatial and temporal regulation of cellular signaling. p14 and MP1 form a tight(K(d) = 12.8 nM) endosomal adaptor/scaffold complex, which regulatesmitogen-activated protein kinase (MAPK) signaling. 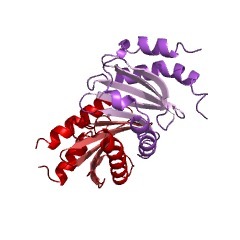 Here, we present the 1.9-Acrystal structure of a biologically functional p14/MP1 complex. The overalltopology of the individual MP1 and p14 proteins is almost identical, having acentral five-stranded beta-sheet sandwiched between a two-helix and a one-helixlayer. 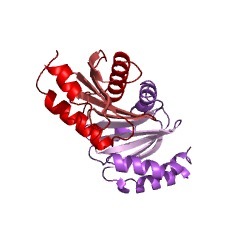 Formation of the p14/MP1 heterodimer proceeds by beta-sheet augmentationand yields a unique, almost symmetrical, complex with several potentialprotein-binding sites on its surface. Mutational analysis allowed identification of the p14 endosomal adaptor motif, which seems to orient the complex relative tothe endosomal membrane. Two highly conserved and hydrophobic protein-bindingsites are located on the opposite "cytoplasmic" face of the p14/MP1 heterodimerand might therefore function as docking sites for the target proteinsextracellular regulated kinase (ERK) 1 and MAPK/ERK kinase 1. Furthermore,detailed sequence analyses revealed that MP1/p14, together with profilins, definea protein superfamily of small subcellular adaptor proteins, named ProflAP. Takentogether, the presented work provides insight into the spatial regulation of MAPKsignaling, illustrating how p14 and MP1 collaborate as an endosomaladaptor/scaffold complex.